Vancouver Urban Ministries has joined the Scotiabank Charity Challenge this year! 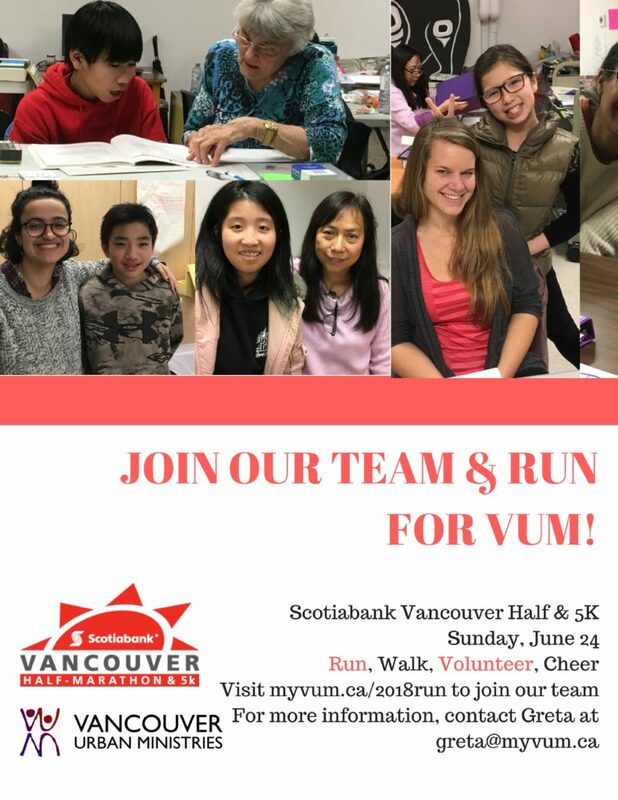 Join our team and run for VUM on June 24th. Our Executive Director, David Innes, will be taking up the challenge, and leading a team for the half-marathon! If a half marathon is a step too far for you, our Admin Coordinator, Greta Lin, will be leading a 5k fun run team! All the money we raise together from sponsorship will allow us to provide materials for 10 new kids in our free specialised tutoring program. You don’t have to be an athlete to join. In fact, few of us have ever run before or ever fundraised before either. All you need is a passion for helping disadvantaged little kids with learning difficulties because that’s what unites us as a team and carries us together over the finish line! •The heartfelt gratitude of disadvantaged little kids in East Vancouver that you’re literally stepping up for. Every step you take will help a little kid take big strides in their education. Come and join the team and help transform the prospects for a little kid in the poorest neighborhoods of East Vancouver. You can join our team as an individual or ask others in your church, workplace, or social group to join you and run together for VUM. How to Joing the Charity Challenge? Once at the Scotiabank Charity Challenge section, choose "yes" and select "Vancouver Urban Ministries"
What if I can't run? Keeping us in your prayer as we fundraise for adding 10 more children into our program!